No doubt you’ll recall the name “Publius” from high school civics. It was the pen name shared by Alexander Hamilton and James Madison (mostly), and John Jay (a few times) when writing an extensive series of essays about the then-new U.S. Constitution. 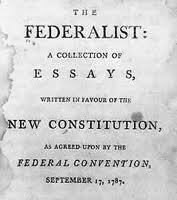 Collectively, the essays were known as The Federalist, or The Federalist Papers. I just read a 2008 book about The Federalist entitled Liberty’s Blueprint by Michael Meyerson, so the Federalist has been on my mind. It’s remarkable stuff–extraordinary thoughtful, well-reasoned, and (for the essays written by Madison), extremely well-researched considerations of how the U.S. Constitution ought to be applied in our new nation. So much of it remains relevant–astonishing, given that these essays were written in 1787 and 1788. As I find myself thinking about what we know, why we know it, why we believe so strongly in what we know, and how minds change, I found one passage especially helpful in my thinking. I figured I would share it with you. “According to Publius, the motivations for people’s differing beliefs and conduct can be divided into three broad categories. The most powerful and most destructive of these is “passion,” whereby a person’s intellect is dominated by prejudice and emotion. Next is “interest,” which arises from rational but selfish considerations. Both passion and interest can be be harmful to civilized society; when Madison defined faction [which we would now call “special interest’] in Federalist 10, he described citizens who were united “by some common impulse of passion, or of interest” which was opposed to either the rights of others or the interests of the community at large. In contrast to passion and interest is reason, which according to Madison is “timid and cautious.” Reason represents the culmination of logical thought combined with either a concern for the needs of others or, at minimum, the recognition of one’s own long-term interest requires such concern. According to Publius, under normal circumstances, people act according to their passions and interests rather than their reason. As I spend a sunny summer day pondering Publius, I wonder about our media, and our flow of information. I want to believe that reason is our guide, but I know I am wrong. Emotion, lack of context, prejudice, incomplete stories crafted by self-interest, these are the winds that propel today’s media, the ideas that fuel FOX and reduce local news to “team coverage” of local fires, abused dogs, and urban children dead because of a stray bullet. Emotion rules. With prejudice. Special interests (Madison’s “factions”) write not only the press releases, but the news stories, and, too often, the laws on which those news stories are based. There may be no better way–would we prefer that government or large corporate advertisers fund our news, for these seem to be the only available choices–but for today, at the end of a very pleasant one staring at the clouds, I prefer reason.